Harry Chernin, beloved husband, father, grandfather and great grandfather was reunited with his wife Mary Charles in heaven on July 22nd. Harry was truly one of the Greatest Generation. 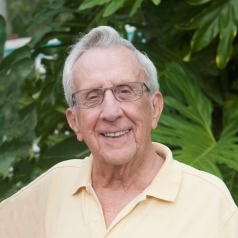 He loved his family, his country, and the Fort Myers area. One of his favorite activities was watching the Caloosahatchee and the activity on it. He was an avid fisherman and enjoyed fishing the local waters as well as nationally and internationally. Harry was born in New York, NY in 1924 and moved down to Ft Myers in 1932 at the age of 8. He graduated from Ft Myers High in 1942 where he was Treasurer of his Senior Class and President of Key Club. WWII took him to the Aleutian Islands where he served his country in the Army Air Corp and after the war attended University of Florida until leaving to help his Dad start The Beachcombers International Inc. In 1946 Beachcombers began on Hendry Street downtown, later moving to North Ft Myers. Although work took him all over the world and to almost every part of the United States, he loved home most of all. He was a Flying Colonel with Delta Airlines. Harry retired at the age of 91 after selling the business. His three daughters and one son-in-law had the great pleasure and honor to work with this brilliant, hardworking entrepreneur. He loved his business, employees, and his customers and has been recognized nationally as a leader in the Souvenir and Gift industry. Truly, Harry’s greatest love was his family. He was married to Mary Charles Acuff in 1950 and they built a wonderful life together for 67 years until her passing in October of 2017. He deeply missed her. Their legacy was their family. What a blessing it was to have them as parents! Harry was a strong, caring, wise Father. He leaves his 3 daughters and their families to remember many wonderful memories. His girls and their families are: Leslie Chernin Morreale, (Ray), and granddaughters Devon Morreale Parker (Trey) and great-grandson Harry and Rachel Morreale and fiancée Miles Eckert, Nancy Chernin Romstadt (Joe) and granddaughter Amy Romstadt, Betsy Chernin Vereb (Roger). He also leaves many friends and nieces and nephews who will miss him greatly including his morning coffee buddies. He was predeceased by his parents, Ben and Elizabeth Chernin, brother Irwin (Chick) Chernin and his children. In lieu of flowers the family would appreciate donations in memory of Harry Chernin to Operation Open Arms, an organization that honors our veterans, www.OperationOpenArms.org. Visitation with the family will be Thursday, July 26th from 6 pm to 8 pm at Harvey-Engelhardt Funeral Home and the funeral will be at 1 pm on Friday, July 27th at Harvey-Engelhardt Funeral Home. Interment will follow.